If the Eagles were to trade, say, for example, Vinny Curry, they would not benefit from his cap savings until after the start of the new league year. When the NFL's new league year begins in less than two weeks on March 14th, every team must be under the salary cap. Presently, the Philadelphia Eagles are projected to be about $9 million over the salary cap at that time, based on a projected salary cap by OverTheCap.com of $178 million. If the Eagles trade Nick Foles, is Nate Sudfeld ready to be the No. 2 QB? One logical way for the Eagles to help themselves get under the cap would be via trades that help save cap space. For example, a trade of Nick Foles would save the team $5.2 million against the cap. A trade of Vinny Curry, again just for example, would save $5 million. Unfortunately for the Eagles, agreed upon trades made prior to the start of the new league year cannot be executed until the new league year begins. According to league rules, every team must be below the cap by the new league year, sans the cap relief achieved by trades. For example, by trading quarterback Alex Smith to the Washington Redskins, the Kansas City Chiefs will eventually save $17 million on their salary cap. However, they are still projected to be over the cap by around $2 million when the new league year begins, because they won't benefit from the cap relief achieved by that trade until sometime after the NFL flips to the next year. Got it? OK, so how does that affect the Eagles? • P Donnie Jones: Donnie already did the Eagles a solid by retiring. His cap savings is $1,625,000. That got the Eagles to roughly $9 million over the cap. • TE Brent Celek: The Eagles will hope (maybe even nudge) Celek into retirement. Should Celek retire or the Eagles release him, that would be a savings of $4 million. • WR Torrey Smith: Smith had some good moments in 2017, but his hands were inconsistent and he went long stretches without contributing difference-making plays in the offense. If the Eagles were to opt not to pick up a team option on his 2018 salary, they would save $5 million. Those moves alone would likely get the Eagles under the cap, again, at a projected league salary cap number of $178 million. 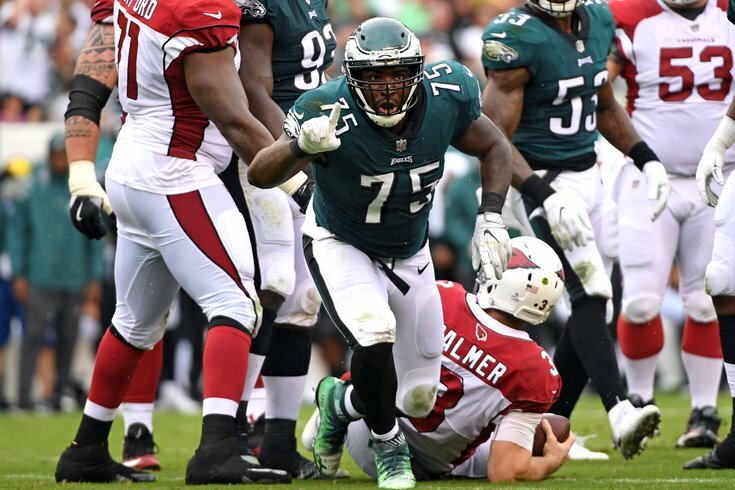 The Eagles could also reach agreements to restructure the contracts of some players, with Jason Peters being the most obvious candidate for that. A recent report by Mike Florio of ProFootballTalk.com says that the cap may actually be in excess of $179 million in 2018, which would give the Eagles a little more breathing room. So, even without the benefit of pre-league year trades counting toward their cap savings, the Eagles will easily be able to get under the cap by March 14th. Still, in regard to trades not triggering simultaneously with the new league year, that is a dumb rule that benefits neither the teams nor the players, and the NFL should change it. My apologies for the super nerdy informational post. Probably need a girlfriend.